The funky chaos of the 2009 Venice Biennale. SIPA/Associated Press An art installation by Italian artist Fabrizio Plessi at the 2009 Venice Biennale. Biennials are the exhibitions all art lovers love to hate, and the Venice Biennale (through November 22) is the one we wouldn’t miss for the world. The reason? Take your pick of clichés: Timing is everything; but don’t forget location, location, location. Born in 1895, the Biennale was the first of the great recurrent international exhibitions, but even if the Carnegie Museum of Art had been a bit quicker in kicking off the first edition (1896) of what is now the Carnegie International, it’s hard to imagine the prospect of another trip to Pittsburgh setting the aesthete’s heart aflutter quite like that of a visit to La Serenissima. Venice is pre-eminently the city of art, meaning not just that it houses a great many works of the highest order–like many other cities, including its old rival, Florence–but that the city as a whole is a superlative embodiment of art. 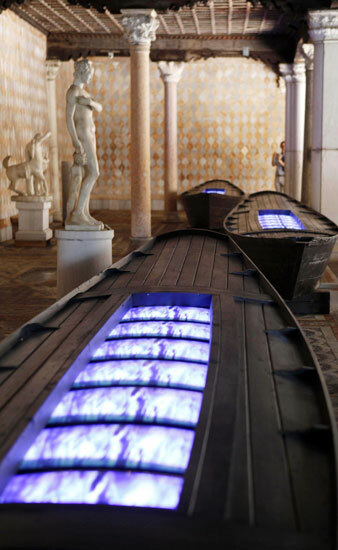 Precisely because the art of our time is so deeply marked by an anti-aesthetic spirit, a suspicion of every quality that has already been certified as a guarantee of artistic value, seeing contemporary art in Venice–this “jeweled bathtub for cosmopolitan courtesans, cloaca maxima of passéism,” as it was denounced by Marinetti in 1910–is a perfect way of testing its ability to go against its own grain. As the Biennale’s tentacles spread ever more thoroughly into every part of Venice, we begin to experience contemporary art as a city in itself, overlaid on the existing one with which it is deeply in tension, as in some lost fable by Calvino. Then what’s the problem? Clearly, the form of the mega-exhibition. The complaints are legion, and all in their way justified. The exhibitions have become too big, too crowded, too hectic; instead of qualitatively sifting the masses of art being produced, they simply follow a more or less arbitrary selection schema and toss the results back at the public to sort through. For many, the ne plus ultra of this tendency was Documenta 11 in Kassel, Germany, in 2002, curated by Okwui Enwezor. Thanks to its emphasis on video, the “650,000 visitors [who] came to appraise around 450 artworks on a surface area of 13,000 square metres” (according to the Documenta website) often left wondering if they could have sat through all that footage even if they’d stayed the whole hundred days of the exhibition. Of course, these complaints have been common since before the big exhibitions became as big as they are now, and well before the advent of “time-based art” (or, as I am tempted to rename it, time-consuming art). Venice differs from most other such extravaganzas not so much in scale as in being a multitude of more or less self-contained parts that can be considered independently of the others, and some of which are more central than others. The central parts are found in the Giardini della Biennale, where the exhibition has been taking place since its inception, and in the nearby Arsenale. The Giardini houses thirty pavilions, twenty-eight of them belonging to the nations whose participation has been longest established–primarily European, as one might imagine, along with the United States and Canada, but also including several Latin American countries plus Japan, Korea and Egypt. Each country chooses its own exhibition program, usually a one-person show of a prominent artist or a small group exhibition. The twenty-ninth is the Venice Pavilion, while the thirtieth and largest of the pavilions, once called the Italian Pavilion, is now devoted to a large, curated international group show, in recognition of which its name has been changed this year to Palazzo delle Esposizioni. (In exchange, Italy has been given its own pavilion at the Arsenale; a shaky start has been made of it, with a group presentation that completely ignores the Italian artists who are actually making any impact internationally.) This group show is the component of the Biennale that is comparable, but on a global rather than a national scale, to exhibitions like the Whitney Biennial. But in Venice it is only one piece of the puzzle. As this curated part of the Biennale has grown more important, it has been given more space. In recent years it has been expanded beyond the original pavilion and taken over the Corderie of the Arsenale, a long, almost tunnel-like building about a fifteen-minute walk from the Giardini, in which the ropes for the Venetian navy were once made. This year the curator is the Swedish-born, Germany-based critic Daniel Birnbaum. Upholding the tradition of giving the shows vague but grand-sounding titles that have the aroma of a theme without actually committing the curator to including or leaving out anything in particular, his exhibition is called “Fare Mondi” (Making Worlds). The reach of contemporary art has grown enormously of late. Nearly every country wants a pavilion in Venice, but with the Giardini having been filled to capacity the newer arrivals have to find temporary accommodation elsewhere. There are plenty of stray palazzi for rent around the lagoon, so this year there were more than sixty national pavilions, with the off-site presentations showcasing work from nations ranging in scale from the Republic of San Marino to the People’s Republic of China. The national presentations beyond the Giardini represent the Biennale’s second circle: they are scattered and sometimes hard to find; most visitors make their way only to a few of them. A third circle consists of “collateral events”–exhibitions (forty-four this year) organized independently of the Biennale but recognized by it and included in its catalog. Finally, at the greatest distance from the center are a multitude of events timed to coincide with the Biennale but without any official link to it. As far as the curated exhibition goes, the tendency toward gargantuanism probably reached its peak six years ago, when Francesco Bonami’s “Dreams and Conflicts: The Dictatorship of the Viewer” was merely an umbrella for no fewer than eleven subexhibitions, most of them subcontracted out to other curators (Bonami curated just two sections and co-curated a third with Birnbaum). One section alone, “Utopia Station,” curated by Molly Nesbit, Hans Ulrich Obrist and Rirkrit Tiravanija, included more than 200 artists and collectives in an outdoor setting that felt like a high school Earth Day fair, all earnestness and good intentions, however ineffectual. By contrast, “Fare Mondi” includes the work of only about ninety artists. Even allowing for a curated portion that has been much scaled back since 2003, one could not see the entirety of the Biennale without devoting a couple of weeks to the task. Whether anyone ever actually does so, I doubt. To say this is not merely to make a point about the practicalities of the visit. Because each country chooses the art in its pavilion internally, the differences among them amount to a practical demonstration of the multiplicity of perspectives in the burgeoning international art world. This doesn’t mean, of course, that a given country represents a particular perspective on art, or that there is a particular international perspective–art is contentious everywhere, but the ideas under contention vary sufficiently that even well-informed viewers are liable to misunderstand (and to dismiss as naïve and outdated, or as slick and facile) work that emerges from unfamiliar contexts. From within the contemporary international art world, one can have the impression that everything is converging into a sort of aesthetic pensée unique. But to wander among the national pavilions in Venice is to be forcibly reminded that if such a convergence is occurring, it is happening very unevenly. While many of the smaller countries make every effort to present up-to-date forms of installation art, video and whatnot, others choose to ignore these forms altogether. As an example, Ahmed Askalany’s stylized figurative sculptures made of woven palm leaves–Askalany is one of two artists in the Egyptian pavilion this year–would probably have been considered too close to handicrafts to feature in the pavilion of any Western nation, let alone in the curated show. And yet for all their propensity toward a too-generalized humanist sentiment, his sculptures are artistically stronger than most of the contemporary-seeming work in other pavilions. For the British critic Lawrence Alloway, writing in 1968, the capaciousness of the Venice Biennale already showed that the quantity of works and artists and possible styles meant that it was no longer possible to hope to arrive at the “uniform validated standards” to which art critics once aspired; forty years later, given the Biennale’s exponential growth, that is even more the case. And yet, paradoxically, that same growth has made it easier to ignore the consequences that Alloway saw clearly. Then, when the Biennale took place only within the confines of the Giardini, each visitor was likely to enter every pavilion and was sure to come upon something that challenged his or her aesthetic assumptions–whether by being too radical, too conservative or simply too unexpected. Today, when the viewer must pick and choose what to see because the whole is too big to take in, one is more likely to see just those presentations featuring art one already knows or at least knows enough to be curious about. And of course, the more of an art world insider you are, the more likely this is to be the case. One goes to the Biennale in order to encounter something new, to have one’s assumptions challenged, but the very scale of it makes that ever less likely. Another paradox: as Alloway acknowledged, far from flattening and standardizing responses, the diversification and multiplication of artists, works and experiences means that “first-person awareness is more singular than ever, as art is encountered in changing contexts.” For Birnbaum, the same idea holds for the curator: “The chaos on my table,” he writes, “is probably as close as one gets to a master plan for this exhibition.” The very first sentence in his catalog essay, for that matter, is a single word standing there like a totem: “Bricolage.” It’s a simple, everyday French word that means something like “DIY” or “patching up,” but it has enjoyed enormous intellectual success since Claude Lévi-Strauss employed it in The Savage Mind, in 1962, to describe the way mythic thinking is constructed, not systematically but through tinkering with pre-existing ideas from various sources, bending and hammering them into shape, as it were, to make them fit together. Jacques Derrida and Gilles Deleuze are just two of the thinkers who took up the term and widened its application, but few artists have needed any theoretical justification for recognizing something of their own practice in the term. Birnbaum’s choice of artists, and above all his installation of their work, demonstrates an appealing empathy for all that is intelligently fluid and spontaneous in the contemporary art mainstream. This is especially notable at the Corderie, which has always seemed a deeply unsympathetic venue because of its long, narrow structure. Walking through the exhibitions here has felt a bit like strolling through a pedestrian shopping street, glancing at the wares to one’s right and left. There was never any sense of flow between one artist’s work and the next. But by reducing the number of artists, Birnbaum has not only been able to grant them more space; he has managed to carve out spaces of different dimensions, more intimate or more expansive as their art demands, and in such a way as to create a path for the viewer that feels not strictly rectilinear but serpentine and organic. And while the art that Birnbaum has chosen is quite various–within the limits of what is currently presentable as sophisticated contemporary art–the predominant aesthetic recalls that of the New Museum’s 2007-08 exhibition “Unmonumental,” which favored assemblage-based work that is (as the New Museum curators put it) “materially provisional and structurally precarious.” In the Corderie, painting, photography and even self-contained sculpture are not entirely absent, but they are overshadowed by makeshift arrangements of objects and images. Grids and straight lines are out; scatter and unpredictability are in. At the New Museum, the choice of works and their installation in its cramped confines had the unfortunate effect of undermining one’s sense of the distinctions among the various artists’ projects. Birnbaum succeeds in sharpening the distinctions, even if the accompanying rhetoric is cramped and confining. “For Pascale Marthine Tayou,” one reads, “the ceaseless movement between places and contexts, forms and media, has become a permanent condition,” but the same might have been said of most of them as easily as of the Ghent-based Cameroonian Tayou. But ultimately, the rhetoric isn’t a big problem. More so is that, subsumed into the artwork, the “ceaseless movement” of its context becomes an artifice, a fiction, even a mannerism, because as soon as the random matter of daily life is given a form, a name and a date, it takes on a kind of permanence or at least longevity, albeit one that costs more effort to maintain. In any case, it is easier to note that many artists today want their work to acknowledge impermanence, flux and multiplicity than it is to put words to the visual evidence of their distinct and characteristic ways of doing so. But what the rhetoric doesn’t acknowledge is that this art is not so much about the “permanent conditions” within which today’s artists find themselves working as about the sensitivity, spontaneity and idiosyncratic élan with which they react to them–about the artist’s “genius,” though the word is taboo. Just as much as with the neo-Expressionist painting of the ’80s, though perhaps more intelligently, the assemblage sculpture of the present decade has been about the power of artistic subjectivity. If Rachel Harrison is in many ways the midcareer artist of the moment–and her appearance in “Fare Mondi” is merely one more reminder of that–it is because of her uncanny ability to put images and materials together in a way that not only always seems to have a hidden logic but also outstrips the viewer’s ability to explain it. That viscerally experienced distance between the artist’s awareness of the possibilities inherent in her material and one’s own gives the work its sense of surprise but also marks its exemplary status. And the funky, offhand look Harrison cultivates is a permanent reminder that she didn’t have to sweat over creating that oblique logic; when intuition and intelligence are one and the same, it all comes naturally. Still, if the test of genius today comes in the encounter with the condition of multiplicity, what’s apparent in Venice is that the attempt to counter multiplicity with more multiplicity is at best merely an inspired stopgap. The opposite strategy, facing multiplicity with singularity and blankness, flux with stillness, is just as valid. Among the best works in “Fare Mondi” are a group of large-scale paintings on paper, made in the early ’70s by Tony Conrad, who is better known for his structuralist films and minimalist music (he was a member of Dream Syndicate with La Monte Young, John Cale and others). All titled Yellow Movie, their imagery of a white or yellow rectangle framed by a roughly painted black border in turn surrounded by yet another color suggests a blank movie screen in a dimly lit space. The artist’s conceit was that, painted with inexpensive, unstable paint, the rectangles would gradually yellow, and this imperceptible change would make them the slowest motion pictures ever made. Conrad mixes media in the mind, not in the gallery space. But just as he renders the distinction between movement and stillness moot, so does his minimalism undo the distinction between multiplicity and singularity, since the simplest differences of color, proportion and touch are sufficient to give these works all the complexity they need to linger in the mind, not as generalizations but as concrete particulars. This is not to say that Conrad’s reaction to the condition of art is inherently superior to that of Harrison, or Tayou, or of many other good artists Birnbaum has included. It’s only to say that it stands out by standing against the exhibition’s presiding aesthetic; because art teaches us to value the anomalous, a dominant aesthetic always undermines itself. If there’s one thing you can depend on, it’s that assemblage will not be the main event at the next Venice Biennale, because it will be felt to be too familiar, too easy. In a Biennale in which the national pavilions seemed extraordinarily flat, the best of them was the one that the Biennale itself rightly awarded its Golden Lion, the mini-retrospective of Bruce Nauman in the American pavilion (with two off-site supplements), curated by Carlos Basualdo and Michael Taylor of the Philadelphia Museum of Art. I say this with some regret as I believe that a survey of such a well-known artist is not necessarily the best use of a pavilion; I’d have been happier if a chance had been taken on a younger, unconsecrated figure such as Harrison. Or at least if the Nauman show had consisted entirely of recent work. For Venice, Nauman produced a new sound installation in two versions, Italian and English, Giorni and Days. Each is a space filled with a hubbub of words that soon turn out to be a variety of voices enunciating the names of the days of the week, but not in order. There is a logic to the sequences, but unlike the logic behind Harrison’s works, it’s not beyond one’s grasp; it just takes a little time and concentration to catch on to it. That logic is of no particular interest in itself; it simply serves, I think, as a way to introduce a certain sense of irregularity into the texture of the words. A close contemporary of Conrad’s–both artists are nearing 70–Nauman shares his intuition that stillness is always already in movement, minimalism already dense with detail. In Days, clamor and multiplicity resolve into clarity and simplicity and then fall back again: this, according to Nauman, is the structure of time.